Relationships. How do we measure the value of a relationship? Customer Relationships. How do we measure the value of customer relationships? We have an answer. But I think it’s the wrong one, or at the very least an incomplete one. If we were all in a room together, many of you likely would have shouted out words like “profitability!”, or “revenue!”. Maybe some of the more advanced thinkers would throw out “CLV!” (Customer Lifetime Value). As companies measure the value of customers, we typically only look at Dollars, or Euros, or Yen, or whatever the local currency is. We limit our evaluation and ranking of our customers to how much capital they have contributed to our organization in the denomination of monetary currency. But aren’t there other forms of capital? You’ve heard the terms: Relational capital, Social capital, Human capital, etc. Identifying relational value should include all the components of the value created by that relationship, but today’s CRM systems typically only include monetary measures in identifying how much a customer is worth to the company. There is a whole set of value being generated and given to us by not just our customers, but many members in our relationship ecosystem. The problem is that we are not measuring it. Since we are not measuring it, we don’t know what to do with it, and are likely missing opportunities to create more opportunities of value exchange. If people are only interested in money, we call them “golddiggers”. Shouldn’t our systems enable and empower richer professional relationships than this? It is very interesting indeed. But I think I have a good idea of where that hiring company is going. Today, I’m going to turn our attention to the second required role for your company: The Social Anthropologist. I don’t know about you, but when I hear that phrase, it immediately brings to mind sleepy images of some British guy talking slowly and methodically on a Sunday afternoon about some displaced nomads in the bush of Botswana. But that’s not what I am talking about here. I’ve said it once and I’ll say it again. Know your customer. Today, most companies are doing a good job of profiling their customers based on transactional data. (1) Who spent the most money with us this year? (2) Who is forecasted to spend more money with us next year? (3) What net new opportunities do we have? We may be breaking this data down by region, SIC Code, etc. We may have history of our marketing campaigns, response rates, phone calls, web form submissions, email interactions, sales person’s notes. We’ve got it all; Mounds and mounds of data about our customers. With all this data, we may think we know our customers. But we don’t. In fact, we know very little about them. Harvey Mackay set out decades ago with his Mackay 66 to learn more about his customers. It was a differentiator. This was the next step towards actually knowing our customers. Do something like this, and you’ll be heads and shoulders above most of your competition. But what if we were to take it even one step further? What if we were to not just know about our customers, but also about the groups of people that they were part of, who they interact with, how they interact, and why? Social anthropology is the branch of anthropology that studies how contemporary living human beings behave in social groups. Practitioners of social anthropology investigate… the social organization of a particular people: customs, economic and political organization, law and conflict resolution, patterns of consumption and exchange, kinship and family structure, gender relations, childrearing and socialization, religion, and so on. Most of our customers don’t live on an island (unless they live in Hawaii, or Australia, or… Suwarrow). No, I’m not talking about that kind of island anyway. Strive to learn about your customers (and prospects) in the context of their lives. They (We) all have circles of friendships, professional relationships, patterns, etc. that we live by. We have patterns of decision making, and we all make decisions based on influence of those we know and trust. By understanding more about those who influence our customer’s decisions; who they interact with, how they interact, and why they interact, we may discover valuable insights that may help us to meet our customer’s needs better, and if your organization is prepared enough, even co-create solutions with them. Conversely, we may also begin to understand who our customers influence, and why a successful sale might not only allow us to recognize revenue from that single purchase, but also a chain of purchases based on the influence and recommendation of our customer’s purchase decision. These insights are not only valuable for each individual prospect or customer, but also in aggregate. By profiling groups or segments of our customer base (or our target market in general), we can potentially gain key insights into who is likely deriving the most value from our products and service offerings. 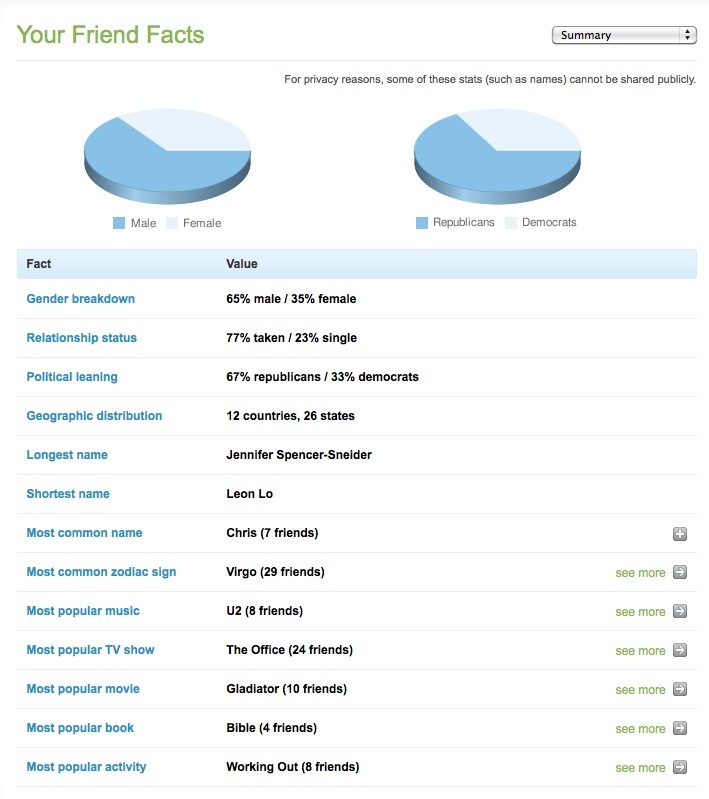 Feed.ly knows that 65% of my facebook friends are male, their most popular music group is U2, and their most popular movie is Gladiator. While this may not present immediate opportunity in your mind, the point is illustrated. By knowing who I talk to, what their interests are, when and how we communicate, there are numerous opportunities to know more about me, what my preferences are, and what opportunities exist to help me in my daily life. 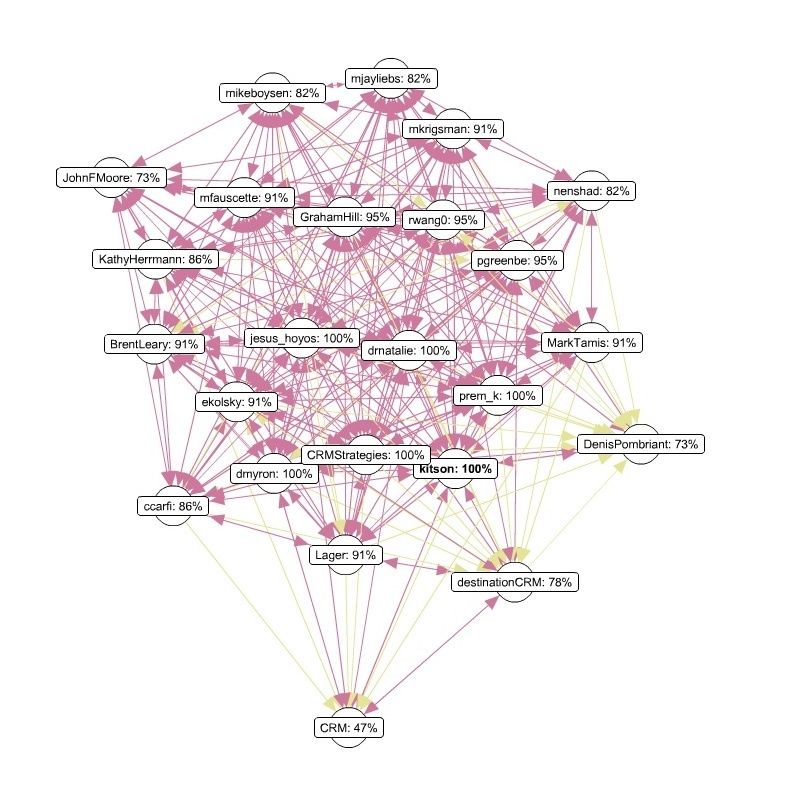 IBM recently did a social network analysis project called SNAzzy , to accurately chart and predict lifetime customer value and churn rates in the telecommunications industry. James Koblieus points out on his blog the huge impact social network analysis will have on data warehouse growth and there are plenty of other challenges that await us as we begin to analyze and make sense of this data, and integrate with our existing systems and processes. This is a new area for me and something I’ll definitely be spending more time on. If you know of any additional resources, please send them over. Your customers and prospects are sharing, talking, conversing, and transacting. Get to know them. Partner with them, and find more people like them. Brent Leary, widely recognized expert on Social CRM, does a great job of summarizing the difference between Traditional CRM and Social CRM in the Inc. magazine Article below. I’ve added some of my additional thoughts. Traditional customer relationship management’s strong suit has been improved operational effectiveness, easier access to data, and improved collaboration. Social media adds the dimension of connecting with potential customers. Connecting with potential customers is one of the biggest challenges facing small businesses today. A recent study by Network Solutions and the University of Maryland shows that marketing/innovation is the single biggest competitive disadvantage confronting small business, after access to capital. In fact, converting marketing leads into buyers and finding efficient ways to promote and advertise, are two areas small businesses say they struggle the most with. This finding is supported by a recent Microsoft small business study, which found customer acquisition and retention to be the biggest challenges facing their small business partners. To help overcome customer acquisition challenges, many small businesses are looking into customer relationship management (CRM) tools and strategies. In the past, many viewed CRM as being too complex and expensive to implement for the expected return on investment. But over the last couple of years, software-as-a-service (SaaS) offerings from the likes of Salesforce.com, NetSuite, and a host of others have allowed companies of all sizes to implement CRM products and services at a fraction of the cost, time and effort needed in the past. The first being that many companies are now looking towards “Traditional CRM” solutions not only because they are interested in improving their customer acquisition efforts, but because they have realized that customer retention efforts are their best bet in an environment where there are fewer new and existing customers in the marketplace. This desire to improve customer retention is currently next to impossible because they don’t really even know who their customers are, and which ones would be the most beneficial to keep. CRM can help with that. SaaS (Software as a Service) offerings have been steadily gaining traction over the past several years, but the argument that it saves cost, time, and effort has been a hotly debated topic. For some small businesses a SaaS solution certainly makes the most sense, but a good percentage of companies still choose an on-premise solution because of 1. Security/Privacy Concerns, 2. Ease of Integration with other applications 3. Lower long term TCO (Total Cost of Ownership). Traditionally, CRM’s strong suit has been improved operational effectiveness, easier access to information, and improved interdepartmental collaboration. While these are critically important to the success of any business, the focal point of these areas are internal to the company. And while a more efficient company should have a positive impact on customer interaction and responsiveness, does it really help us to meaningfully connect with those potential customers empowered in a Web 2.0 world? 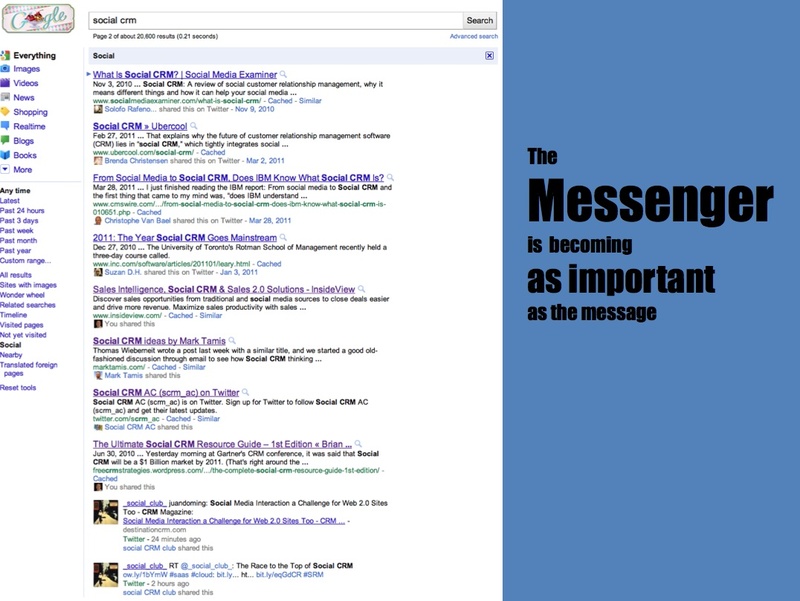 Social media adds this missing dimension to the traditional, operational areas of CRM. 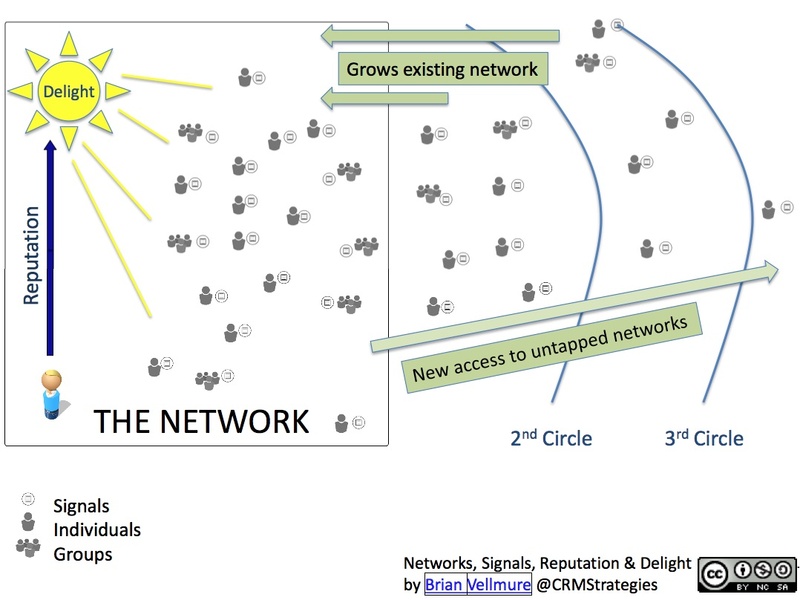 And according to a recent Nielsen Company study, two-thirds of the world’s Internet population visited a social networking site or blogging site — what they refer to as “member communities.” The integration of social media into CR strategy — called Social CRM — differs in focus from traditional customer relationship management in a few key ways. Businesses began investing in CRM applications in the ‘90s mainly to store contact data. Before contact management software was available, businesses had to store their valuable customer information in Rolodexes, spreadsheets, and even filing cabinets. It was important to have a central location to store the data that was also easily accessible to communicate effectively with contacts. And with multiple people “touching” the customer for various reasons, it quickly became important to be able to track activities, appointments, potential deals, notes, and other information. Consequently, traditional CRM grew out of this need to store, track, and report on critical information about customers and prospects. Social CRM is growing out of a completely different need — the need to attract the attention of those using the Internet to find answers to business challenges they are trying to overcome. And nothing captivates the attention of searchers like relevant, compelling content. Having the right content, and enough of it, will help connect you with those needing your product or service. Creating content in formats that make it easy for your target audience to consume it increases the probability that you will move them to action — starting a conversation with you. Whether it be by developing a blog post, podcast, YouTube video, or Webinar, creating attractive content is a key pillar of social CRM strategy. In addition to supporting and enabling marketing, lead generation, and customer acquisition efforts, Social Media and therefore Social CRM are also being leveraged by companies for customer service, brand monitoring, and customer retention efforts. The content production that Brent mentions is a great way of attracting eyeballs and filling the lead funnel, but companies are also integrating “listening” into their Social CRM strategy. Companies like Comcast have used Twitter to monitor negative comments about their brand and take a proactive approach at solving problems for disgruntled customers. Social Media and its integration with traditional CRM efforts have opened up new ways to turn an unhappy customer into a raving fan. Other companies like HelpStream and Lithium are pioneering new ground, using Social Technologies to build communities where customers and prospects interact with each other to solve problems and discuss ways to best leverage companies products and services. Traditional customer relationship management is heavily focused on implementing and automating processes. Companies looking to implement processes like lead and activity management would turn to CRM. Management would turn to CRM to standardize on sales processes to increase the accuracy of sales forecasts. And customer service requests could be tracked, routed, escalated, and resolved in a uniform fashion to ensure proper handling. Traditional CRM helped make it possible to ensure the proper activities and tasks would be performed by the appropriate people, in the correct sequences. While there are processes involved in building a successful social CRM strategy, conversations are at the heart of it. Having meaningful conversations with those searching for the help you can provide is the turning point in transforming clicks into customers. The processes involved are aimed at making it easy for people to find us (through our content) and invite us into a conversation — on their terms. This may take the form of a comment left on a blog post, following your company on Twitter, or possibly embedding your PowerPoint presentation on their webpage. There are numerous ways to participate in meaningful conversations with people looking for help in solving challenges. Formalizing a strategy to increase the likelihood of engaging in these conversations is a tenant of social CRM. As mentioned above, managing customer information is a major concern to businesses of all sizes. It plays a key role in the ability of businesses to respond to customer requests, manage resources needed to close deals efficiently, and provide management with reports to keep track of sales performance. This helps executives achieve operational effectiveness, and is particularly important for businesses expanding their sales and marketing operations, needing to implement new processes to manage growth. Businesses have typically turned to CRM to improve communication between sales and marketing operations, as well as to improve data-access to positively impact decision making. Whereas traditional CRM activity focused heavily on operational effectiveness and its impact — both internally and on the customer — social CRM is all about people and community. It’s about how your company intends to participate in the ongoing conversations taking place in the industry. How you embrace non-traditional influential people like popular industry bloggers, and social sites on the Web frequented by your audience. And fully understanding the importance of contributing to discussions, in a transparent manner, will help you build the kind of reputation needed to become a valued member of the online communities important to your business. So if you’re turning to CRM to help bring on new customers, you’ll have to go beyond traditional CRM focuses by integrating social media infused tactics and strategies. But it’s important to remember social CRM is not a substitute, but a much needed complement to traditional areas of customer relationship management. It gets us close to what we’ve needed all along. Have additional thoughts or ideas related to the differences? Please share them below! If you are just familiarizing yourself with social media and how to leverage it in your organization, Becky Carroll on the 1to1 media blog does a nice job of summarizing the benefits of Social Media, and how companies can leverage tools like Facebook, Twitter, and LinkedIn. She does a nice job of separating the “cool factor” and hype from tangible benefits that can be reaped. Has your company leveraged Social Media to deepen customer relationships?Do you have plans to? What question or concerns to you have? Soundoff. One of the most common questions being asked right now is this: “What should my company do about social media?” As more and more businesses are jumping in and creating corporate profiles on sites such as Facebook, Twitter, and flickr, marketers are feeling the pressure to jump on the bandwagon. Some of these marketers plan to use social media as a cool set of tools to build awareness about their company. However, it is much more than that. Social media can be an integral part of a strategy to build customer relationships. Let’s look at how social media can be used to deepen customer interaction and increase customer loyalty. It allows companies to be perceived as more human. You aren’t just talking to Comcast; Frank Eliason is there for you. You want to know more about Zappos; Tony Hsieh tells it like it is. Customers don’t want relationships with faceless companies; they want relationships with other people. The use of social media hastens the trust-building process by putting people instantly in touch with other people–critical in these days of corporate bail-outs and public uneasiness. Trust is the main component of a strong customer strategy. Customers can’t easily rally around a website, as there is little interaction there; but they can rally around a brand’s presence on social media. What makes these communities so powerful is that many of them have been built and sustained by a brand’s fans. Fiskars, which makes scissors, encouraged the formation of a scrapbooking community. However, it is their customer ambassadors, or Fiskateers, who are responsible for driving the conversation and inviting others to join in. National Instruments uses its community, powered by social media, to bring together business customers to share technical information with each other, which is then used in National Instruments marketing materials. These communities are examples of likeminded people coming together and interacting around a common purpose; in this case, a company’s products and services. Ongoing customer interaction and engagement such as these increase loyalty and ultimately rate of purchase. 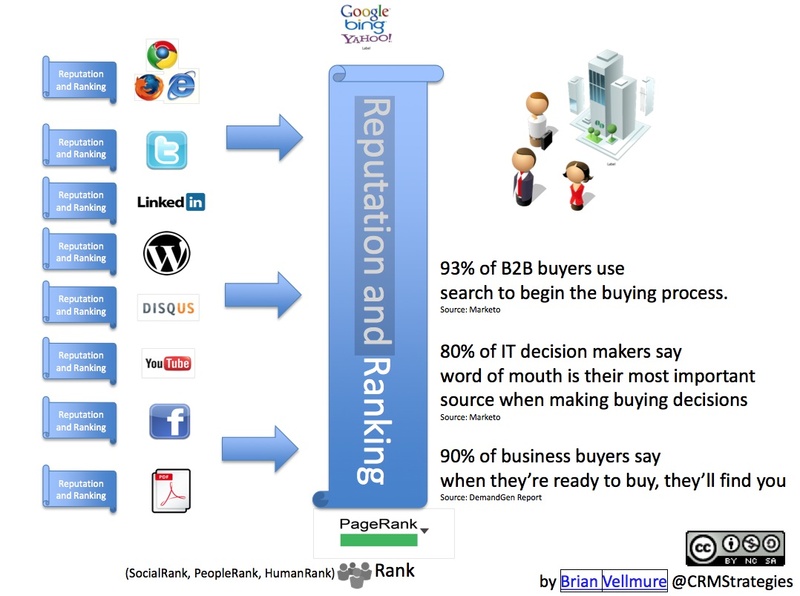 Social media increases word of mouth. It allows information to be shared peer-to-peer at light-speed around the globe. As a result, customers are turning to social media ratings and reviews to research an organization’s offerings before making a buying decision. This is especially true in the B2B environment, where a large number of B2B buyers are participating actively in social media for business–reading blogs, writing reviews, watching user-generated videos, and joining social networks (source: Forrester). All of this enables the rapid spread of company news and information, as well as the sharing of customer success stories. Organizations that enlist their customers to help evangelize their products and services via social media find those customers to be fiercely loyal and willing to share their experiences with others who are like them. This in turn builds trust, as well as the customer base. Social media enables two-way conversations. This is the gold in the equation. Where companies used to have to rely on one-way email blasts, advertisements, and direct mail pieces, they can now interact directly with customers via blogs, Twitter, Facebook, and a myriad of other social media tools. More is required than simply hanging out a corporate shingle on these sites, however. Companies need to fit these conversations into their overall customer strategy and marketing communications plan. In so doing, they will be able to gain deep customer insight from these new online interactions, including an understanding of customer behaviors and needs, as well as online reach and influence. The best way to begin using social media is to stay quiet. Yes, social media enables great customer interactions, but first it is important to do some listening. Once a company has spent time monitoring conversations–about the company, competitors, the industry–only then is it truly equipped to begin participating in conversation. This is the best way to be relevant when stepping forward and inviting customers into your virtual lounge to get to know them, their likes and dislikes, as well as their personal side. The foundation will be laid, and rich customer relationships have every opportunity to blossom from these online engagements. via Guest Blogger Becky Carroll: Social Media Builds Customer Relationships – Think customers: The 1to1 Blog. 1 to 1 was kind enough to share the results of their 2009 Customer Survey. In this are some expected responses. Others are perhaps a little more surprising. At the end of the day, the results reinforce what we all know to be true. Over time, success in business is ALL ABOUT CUSTOMER EXPERIENCE. This Is No Surprise – Or Is It? 1to1 recently conducted its 2009 Voice of the Customer Survey. We asked the question: What is the most surprising thing you learned from customer feedback in the past year? I found some of the responses, well, surprising. What do you think? Given a chance, customers will be brutally honest about how a company treated them and ways to improve [the experience] for other customers. People wanted to be communicated to more. Customers desire information from us, other than our direct product and service areas, e.g. partner and community information. Customers want to be part of the overall strategy of our company. They were willing to spend time helping me refine my offering. Their willingness to share their feedback and make suggestions for improvement. Customers are willing to speak if we ask them. How willing customers are to talk about their personal experiences, challenges, and problems. How easy it is to really listen to client concerns. What a great job our customer care team is doing when handling customer inquiries. We do better than we thought! We do a better job of satisfying customers than we realized. Most of our customers actually like what we are doing. Our company is sometimes hard to work with. How difficult we are to contact if you don’t know who the right person is. Customers really didn’t like our hold music. We saw a 3 point improvement in voice CSAT by simply changing the music. We had a lack of knowledge about customers and what they are looking for. Often the things we think we do badly are often not even on the customer radar screen. The things we don’t really regard as important are! That we overcomplicate our selling model–it is really about engagement versus selling, and leveraging that engagement has been powerful! Price is not the determining factor when customer buy. In an overzealous drive to deliver the best and greatest experiences it is often the basics that we don’t deliver on that crack the foundation of the customer relationship. Customer relationships are like a game of golf: The most amazingly played shot won’t win the round, but a horribly executed one can ruin all. The same service was differently appreciated in Asia or in the Americas or in Europe. They are close to the issue, good or bad, and bring a view that at times we do not consider. The importance of knowing the customer by name. Our customers were using our website to get more information about us. How some competitors have caught up with us in replicating our “unique” product mix. What some of our employees do to break our operational procedures. There is an indisputable link between improvements in customer experience and its link to bottom-line results. It’s great to stop and hear what [customer] are saying; this improves our product, which translates to higher prices and revenue. Listening to customers is a simple way of cutting costs by fixing customers problems or issues. via This Is No Surprise – Or Is It? – Think customers: The 1to1 Blog. As we collectively try to gain visibility to what is happening in the marketplace, the following contains some good basic reminders of necessary requirements to survive in the marketplace today. I’d love to hear about how your company has implemented some of the ideas below and how that has helped your organization succeed. No doubt as the recession takes hold companies are at risk to lose more customers than new ones coming in. The problem: If you don’t invest in keeping and developing your existing clients – especially in tough times – then it’s more than likely that your business will decline. So the question is what are you doing to communicate with your customers? Do you have a structured customer development program to upsell, cross sell and above all manage your relationships in such a way to make sure these customers – whom you’ve already spent a long of money acquiring – from walking?